Kacey Musgraves Stole the Show at the CMAsShe won Album of the Year in a category dominated by men. Adam Rippon Achieved His Dreams and Sniffed Keith UrbanHe owes it all to his mom and Nicole Kidman. Nicole Kidman and Alexander Skarsgard Shared a Tender Kiss at the EmmysKidman’s husband, Keith Urban, was also there. 2017 CMT Music Award Winners: Keith Urban and Carrie Underwood Come Out on TopKeith Urban and Carrie Underwood took home top honors. Metallica Confirmed for ‘Very Unique and Special’ 2017 Grammy Performance John Legend, Carrie Underwood, and Keith Urban have also been announced. Keith Urban and Nicole Kidman Honored David Bowie by Singing ‘Heroes’ on NYEUrban sang a medley that also included songs from Prince, Merle Haggard, Leonard Cohen and Glenn Frey. 24 Observations From 24 Hours on the Set of American IdolJ.Lo on-camera and off-camera seem like very different people. Male Gaze: Keith Urban’s Perfect HighlightsAnd that voice. The Many Cuddle Puddles of CannesIt’s one big photogenic love-in. Jay-Z and Beyonce at Gjelina; Britney Spears Dates New Dude at BanzaiKelly Rowland reportedly broke into tears on Abbot-Kinney following yet another stint as the singer’s third-wheel. American Idol Confirms Season 12 JudgesThat is some S-T-A-R P-O-W-E-R! Nicki Minaj, Keith Urban in Final Idol TalksAnd Nicki would get $8 mil. 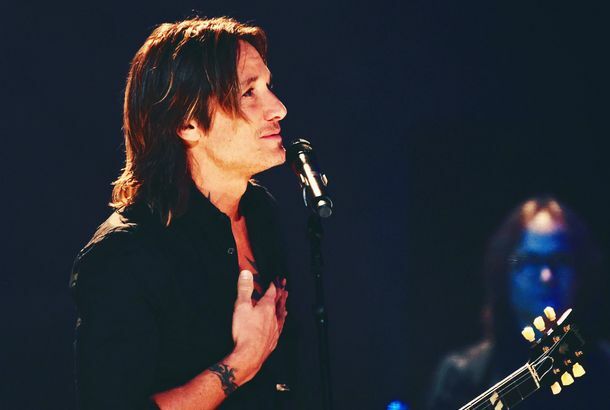 Keith Urban Needs Throat SurgeryWill still perform at next week’s CMA awards. Speculation Over Ron Paul’s Droopy Eyebrow; Armani Continues to Airbrush Megan Fox Into OblivionPlus, ‘Footloose’–inspired nail polishes from Deborah Lippman. Liv Tyler Is Pantene’s New Face; There’s a Cheetah in Emily Blunt’s First Fragrance Ad for YSLPlus, Florence Welch’s hair seems to have grown back already. All of a Sudden Nicole Kidman Has Another BabySee what happens when you let yourself get distracted by sparkly dresses and naughty jokes? Nicole Kidman’s 2-Year-Old Likes to ‘Pop a Little Blush On and Some Lip Gloss’Little Sunday Rose is a precocious one. Underwood, Urban Among Big Winners At CMT Music AwardsSwift shut out. Daniel Radcliffe Discovers a Magical PlantThe 20-year-old ‘Harry Potter’ actor gets stoned, Zsa Zsa owes back taxes, and more “they’re just like us” stories in our daily gossip roundup. Mischa Barton Does Not Want to Work Out, or Eat Hamburgers, at EquinoxIt’s one or the other, we can’t tell. Plus, Kirsten Dunst, Rebecca Gayheart, and more celebrities struggle with issues, in our daily gossip roundup. Lindsay Lohan Will Eat Food for WorkHer latest director has ordered that the skinny starlet pack on some points. That and the rest of today’s gossip! Keith Urban Single Possibly Concerns Frenching Nicole KidmanA well-crafted piece of pop confection that debuted in the top half of the ‘Billboard’ Hot 100 singles chart this week, Keith Urban’s ‘Sweet Thing’ typifies today’s country. Carrie Underwood and Keith Urban Mount Blonde, Ambitious TourPlus: News about Charles S. Dutton! Judd Apatow Gets the Last LaughRight before Undeclared was canceled in 2002, creator Judd Apatow sent a Fox executive a note saying, “I don’t understand how you can [bleep] me in the [bleep] when your [bleep] is still in me from last time.” Christian media-watchdog group Renaissance complained that the female anchors on Fox News wear really short skirts. While taping 30 Rock recently, Tracy Morgan didn’t know his lines, didn’t listen to the director, and got into arguments with cast members on set. Stifler from American Pie and Pedro from Napoleon Dynamite sent out an invitation for their joint birthday party at Room Service to a bunch of modeling agencies. Famed British chef Fergus Henderson is cooking at the Spotted Pig tomorrow. Penélope Cruz and new man Javier Bardem acted “touchy-feely” at the New York Film Festival.